10 SEPTEMBER 20 - 26, 2017 WWW.UPANDCOMINGWEEKLY.COM ARTS MEDIA MEDIA Best Live Theatre Cape Fear Regional Theatre 1209 Hay St. (910) 323-4233 or www.cfrt.org Cape Fear Regional Theatre is a place where, since 1962, magic happens on and off the stage. This past season, its staff and actors worked to delight audiences with a range of shows. These included Shakespeare's "Henry V," Disney's "The Little Mermaid" and Pulitzer Prize winner Lynn Nottage's "Intimate Apparel." Its programming is smart, refreshing and wel- comes audiences who think outside the box. Offstage, CFRT engaged the community with thoughtful discussion panels before shows like "Caroline, or Change," ignited children's imaginations with summer camps and collaborated with every local brewery and many more local businesses for the 15th annual Blues-N-Brews Festival. New Artistic Director Mary Kate Burke started in July, and she's got plans for new kinds of growth and a stellar 2017-18 season, which kicked off with "Dreamgirls" earlier this month. "I think the best live theater really reminds people to take advantage of the time we have," she said. CFRT sees over 42,000 audience members a year. Best Local Actor Ken Griggs Ken Griggs is a multi-talented per- son, a useful trait for someone who portrayed both Sherlock Holmes in "Baskerville" and Chef Louis in "The Little Mermaid" this year at Cape Fear Regional Theatre. He's been acting since 2002 and has been a radiolo- gist with the U.S. Army since 1995. He was chief of Womack Army Medical Center's department of radiology from 1999-2015, and he currently works as a general radiologist with Southeastern Regional Medical Center in Lumberton. A CFRT mainstay since 2012, Griggs has also performed with the North Carolina Symphony at Meymandi Concert Hall in Raleigh (2012), The KD & Sara Lynn Kennedy Theatre in Raleigh (2014) and the Opera House Theatre Company in Wilmington (2015, 2016). With charisma and maturity, he's comfortable playing the lead. He's portrayed Harold Hill in "The Music Man," Phileas T. Fogg in "Around the World in 80 Days" and most recently, Sherlock Holmes in "Baskerville: A Sherlock Holmes Mystery." In "Baskerville," Griggs managed to be both dig- nified and hilarious, perfectly catching the tone of the script. Unfortunately, Griggs and his family will be moving to Maryland this fall in order to be closer to family. He will continue his work as a radiologist there. CFRT will hold a public farewell for him Monday, Nov. 6 at 7:30 p.m. www.goldbuyerfayettevillenc.net 5721 Bragg Blvd. 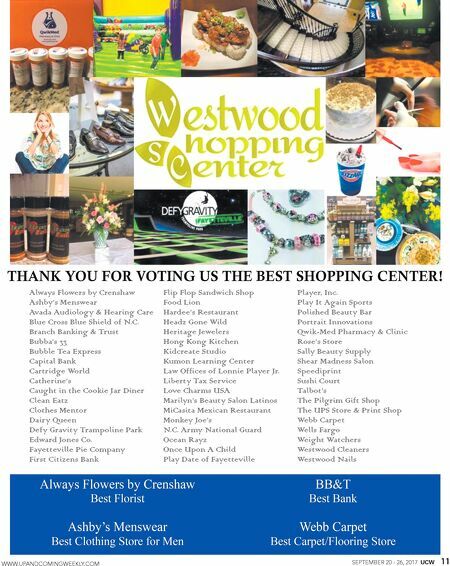 Fayetteville, NC | 910.867.4010 Thank You for Voting Us Pawn Shop Guns • Jewelry • Musical Equipment BEST Thai Pepper thanks our patrons for voting us Best Thai Cuisine R E S T A U R A N T THAI & CHINESE FOOD ENJOY TASTES FROM THE EXOTIC ORIENT Best Thai Cuisine 17 years in a row! 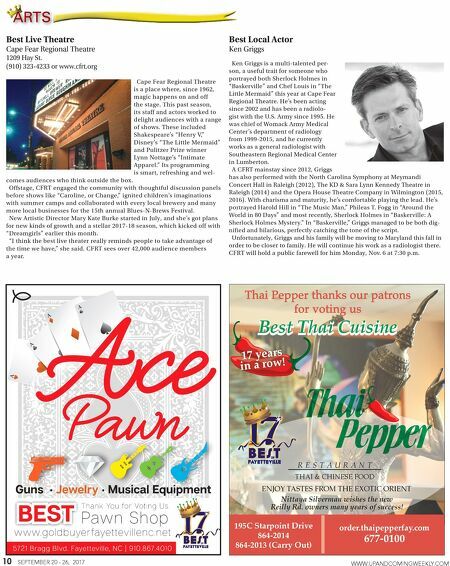 195C Starpoint Drive 864-2014 864-2013 (Carry Out) order.thaipepperfay.com 677-0100 Nittaya Silverman wishes the new Reilly Rd. owners many years of success!